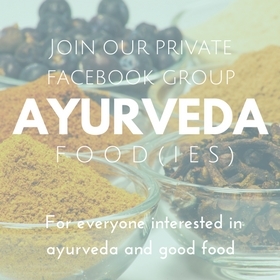 Want to know about ayurveda and chocolate? Then read this post. The egg white is Vata, Pitta and Kapha balancing. The yolk is Pitta and Kapha increasing and Vata reducing. 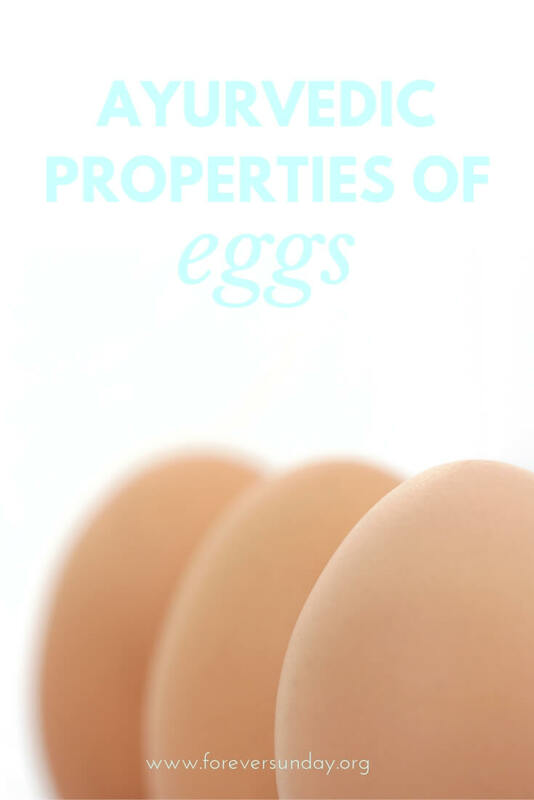 This means that egg whites are good for all types and the yolk (or complete egg) is good for Vata types. Vata often forgets to eat and can use some strength. So for Vata an egg breakfast can be a good idea. Because of their heating energy Pittas should eat eggs (or at least egg yolks) in moderation. 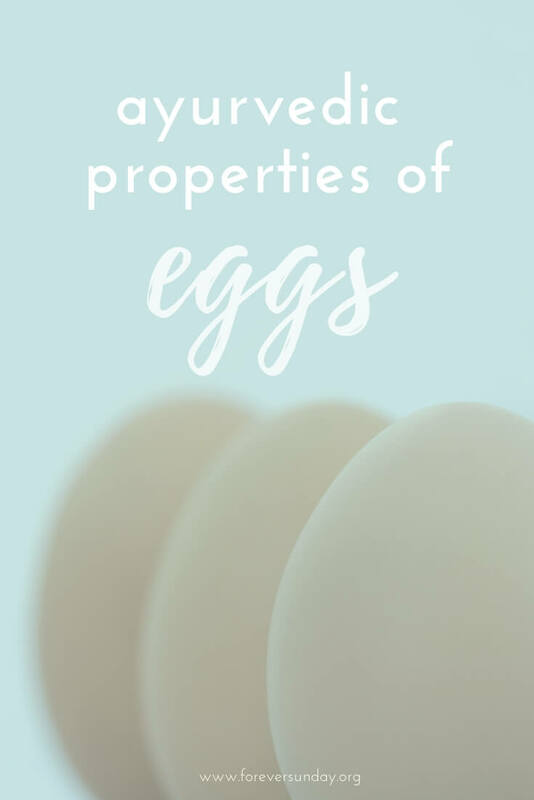 Eggs have a highly nutritive value which makes them great when recovering from illness or building the body when it is weakened by disease. They provide vigor to the body. Eggs are also considered an aphrodisiac and aiding fertility. 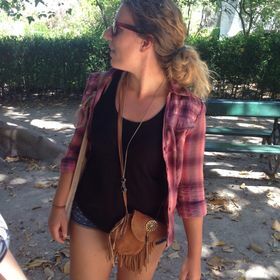 But it is not all good news… Animal products in yoga and ayurveda are considered tamasic meaning they cause inertia in the body and mind (tamasic foods basically turn you into a couch potato). Too many tamasic foods dull the mind and body and while I think no food is off limits, it is good to have an honest look at your choices. We need sattvic (pure), rajasic (energising) and tamasic (impure) foods, but it is important to balance proportions. In the modern day western diet there is too much emphasis on tamasic foods like meat, processed foods, precooked foods, high sugar foods etc. If eggs are one of the few tamasic foods you eat you’re already doing really well compared to many others! Another reason why yogis avoid eggs, meat and fish is because of the karma they carry. The karma of eggs is less bad than the karma of meat as the animal is of course not killed for food. Karma also depends on the kind of eggs you get. By buying eggs from closed cage chickens you are actively contributing to a twisted system and you are going against animal welfare. Also, battery hens are never going to give you an egg that is rich in nutrients like a free range chicken egg. Just compare the colour of the yolks. If you get eggs from the store look at the number that is printed on them: if it starts with 0 they are organic and free range. If it starts with 3 they are cage chicken eggs; they are the worst. when you have a soft boiled egg you can add a pinch of cumin, it’s very tasty! 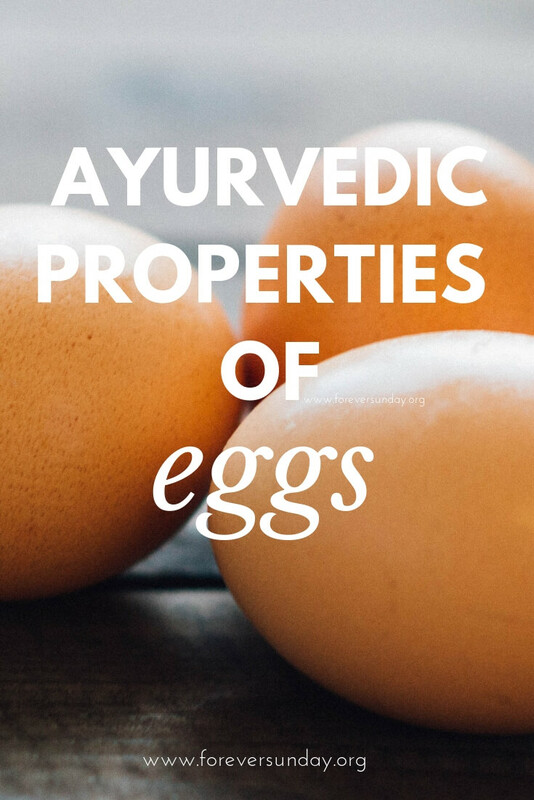 The ayurvedic properties of eggs are Pitta and Kapha increasing and Vata reducing. The egg whites only are tridosha balancing. Eggs are tamasic and carry impure karma but they have their place in our nutrition, especially for Vata types. If you do eat eggs get organic and free range eggs. Know where your eggs come from. Add spices and herbs to your egg to improve digestion. Don’t mix eggs and dairy. And how about the chocolate kind?